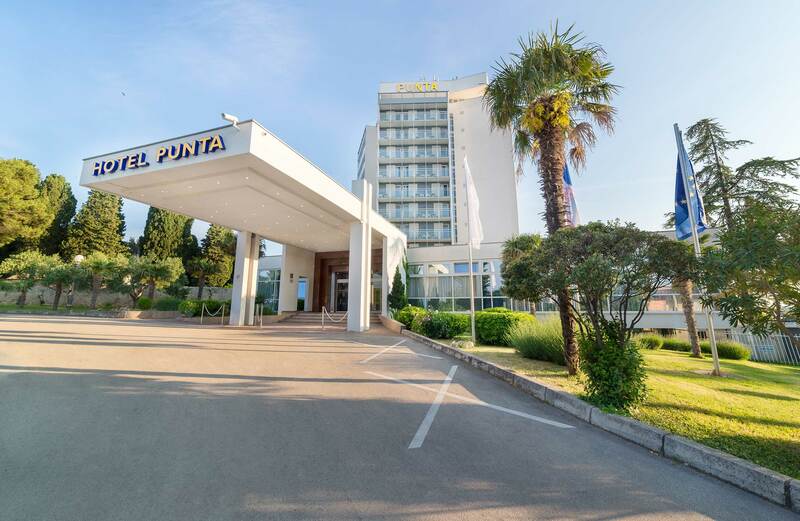 Hotel Punta is located next to the sea in a pine forest on the peninsula of the same name, only 50 meters from the sea and the beach. The complex is away from the center of town just 3 minutes of light walks and lives alive with the city. The crystal clear sea, with its well-preserved concrete and pebble beach, is protected by several islands from the open sea. Only a hundred meters away there is a pebble-sand beach, suitable for children and non-swimmers. Center for Dentistry, Dental Implantology and Aesthetic Surgery - "Medical Dental Adria"
Animation (aquagym, aerobics, mini club, mini disco) from 15.06.-15.09. In the vicinity of the hotel, and as Hotel Punta on the peninsula itself, has several walking or running trails, as well as marked cycling trails. Numerous restaurants and other facilities (near the center). The core of the Punta complex is a ten-storey facility offering a selection of superior or standard room and suites. All 77 superior rooms and the three luxuriously furnished suites offer a panoramic view of the sea and the islands. 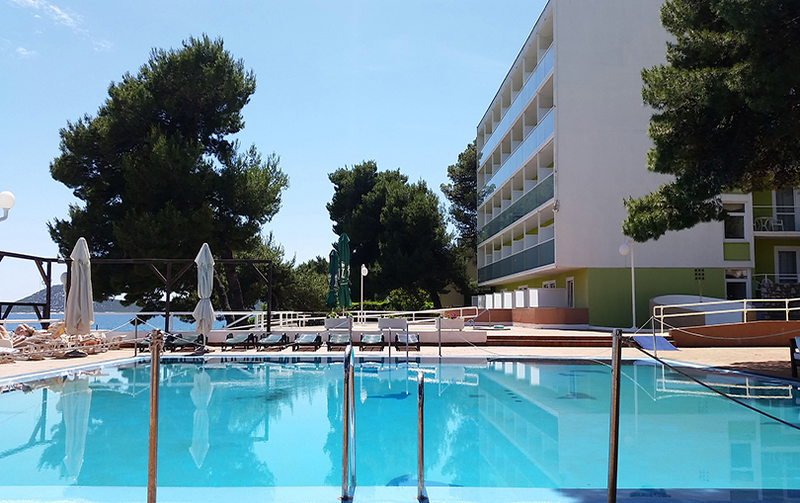 The 52 standard rooms offer a stunning view of the park and the town of Vodice. In addition to a spacious reception area, the main building also houses all of the other facilities that will make your stay a comfortable and fulfilling one, such as two restaurants, a lobby bar, wellness facilities and a spa centre with indoor pool and fitness room, souvenir shop and other multifunctional halls for congresses, seminars or business meetings. The horticulture garden of the hotel park is also the site of the ancient church of the Holy Cross (Sveti Križ), offering visitors both a spiritual and historical aspect of the cultural heritage of the region. In modernly equipped and air-conditioned rooms and apartments, with balcony and sea view. LCD TV, telephone, WIFI, mini bar, safe, hairdryer, the hotel has 128 rooms and 2 hotel suites. All rooms at the hotel are air-conditioned. The hotel is open all year round. Vila Arausa has 60 rooms, mostly double rooms with the possibility of using a third bed. In the Vila Arausi each room has a bathroom, shower/WC, telephone, WI FI, LCD TV sat, mini bar, hair dryer, safe, balcony with the sea view and air conditioning. Villa Arausa is located just by the shore and 50 meters from the hotel restaurant. It also offers the option of choosing superior or standard rooms. The 37 superior rooms provide you with panoramic views of the sea and the islands. 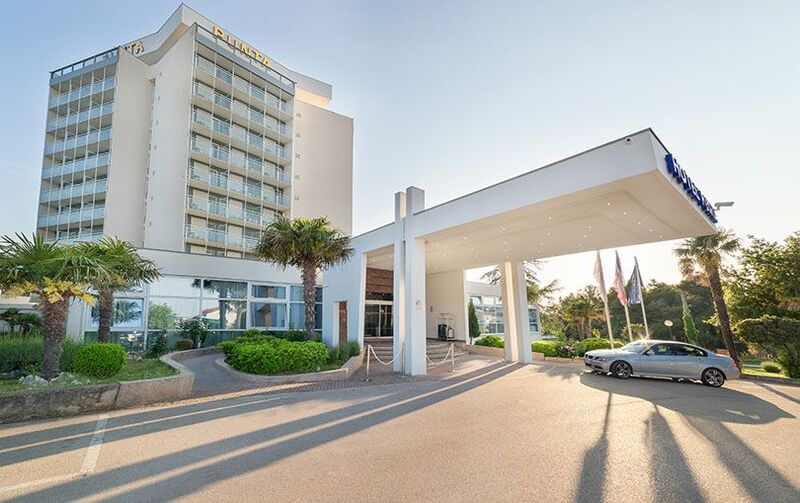 The remaining 23 standard rooms provide a partial sea view, a park view or a view to an outdoor pool. Meals are served in the air-conditioned restaurant at the main building. The restaurant has an outdoor terrace.